Happy New Year from Howl2GO in Texas! We’re kicking off the year with Wedding celebrations in New Ulm and Spring Branch! Either end of the month, we’ll be performing corporate events in our home-town of San Antonio. After a hectic, record-breaking December schedule of shows, we are excited to start our new year, full of amazing shows around the Lone Star State! The first is for AFLAC, and the latter is for our great friends at the National Business Aviation Association. We’re out again for NBAA next month in Austin! We love when a client enjoys our show so much, they bring us right back again in a different city. 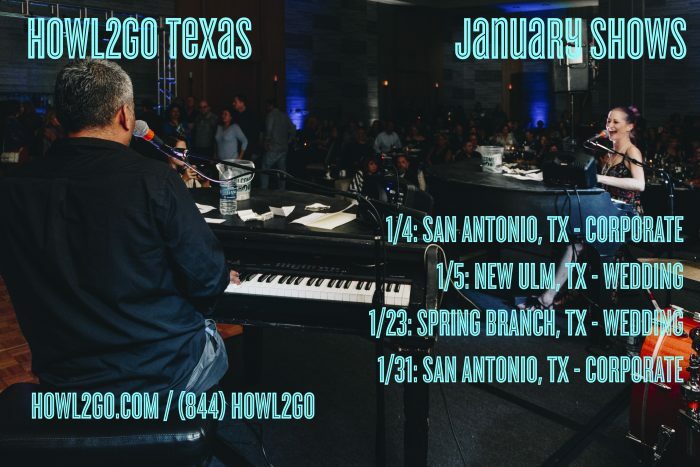 Check back in with us next month where we’ll be taking our Dueling Pianos to Hankamer, Big Spring, Austin, and Houston! Additionally, if you’re in the Houston area on February 1st, you cannot afford to miss our return to The Westin at The Woodlands which is certainly one of our favorite venues to perform! Our Howl2GO Texas crews are ready to come and rock your event in 2019! We book up quickly so please go ahead and fill out the form below. One of our team will call you straight back to begin confirming your event.